I don’t want to draw any conclusions or parallels that aren’t there, I just had a thought after watching bits and pieces of the Grammy’s last night. It seems that performers are doing anything they can to gain attention. Wearing meat suits, coming in eggs, bringing a sceptor, staging an exorcism, having a double singing part of your song only to have everything black out and you’re on a platform looking like you’re wearing a smurf weave, riding onto a football field with a mess of Roman soldiers escorting you, getting everyone in choir robes, flipping the bird, who knows what. Twitter blew up with how creepy, strange, unnecessary, and untalented Nicki Minaj’s performance of Roman Holiday was, and after watching it online today, I have to agree. Compare that to Adele. Adele stood in place on stage, sporting a black dress, and sang beautifully. The entire audience rose to their feet in applause. By the end of the night, what was the final score last I checked? Nicki Minaj + Katy Perry + Madonna + Lady Gaga + MIA – 0 Grammy’s. I’m not saying Nicki Minaj, Katy Perry, Madonna, Lady Gaga, and MIA aren’t talented, or at least marketable. I’m just saying that I found it interesting that the performer who did NOT try and create some buzz of chaos about her was the artist who walked away, entire audience in hand. How does this apply to student ministry? Again, I don’t want to draw any parallels that aren’t there, but I can’t help but think that sometimes we try and do all the high-buzz events, when the pure gospel will attract enough of a following. I think there’s a place for doing something eye-catching to an extent (even though I would rather wear a flank-steak dress in public than do a lock-in), but where is the focus? Are we trying to employ shock and awe, or are we trying to lead people to the truth of the Gospel? If you live in Cabot, you no doubt have noticed the posters, lawn signs, and hangers all throughout Cabot. 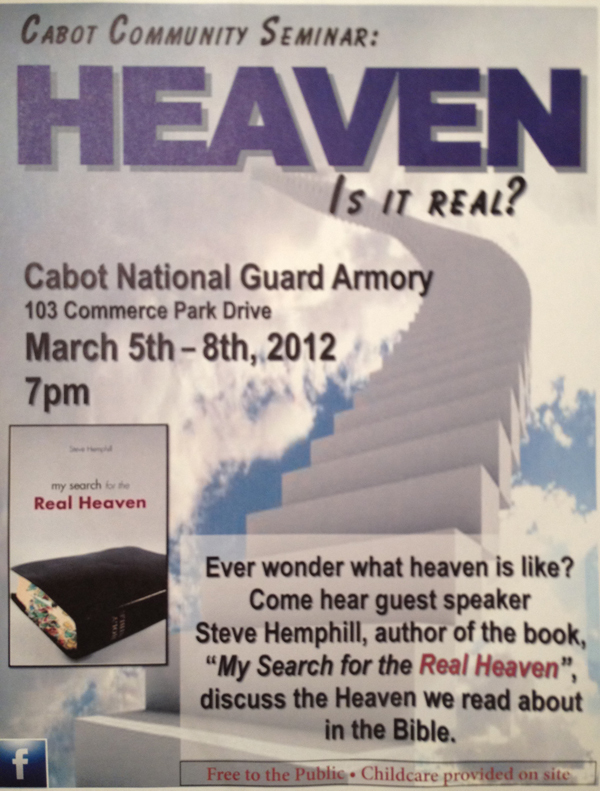 They advertise a community seminar on whether or not heaven is real! These posters have definitely stirred my interest, and I thought I’d take a few minutes to share some observations on it! But first, here’s a link to check out the flyer for yourself! I’ll start with my hesitancies, and end with my pros! Keep in mind, I tend to be more on the cynical side (maybe Ouachita did that to me? ), and these are just thoughts. I’m not saying I’m “for” or “against” the event. 3 nights of “What heaven is like” makes me lean a little to the idea that it could be drawing on more than just Scripture. Again, a dangerous topic to do an outreach event on, and not base it primarily on Scripture. The title of Mr. Hemphill’s book makes me a little nervous as well. There’s no church or organization listed. It seems obvious that whoever is behind this wanted to prevent anyone from feeling like it’s just another “church event”. However, a lot can be said about the perspective a topic will be viewed from based on the denominational, religious, or even local church affiliation. In addition, no church affiliation leaves no means of checking on details. Speaking of checking on details, there’s a Facebook icon…but no link, no page name, no event title. Just a button. If I’m wanting more information about the event, I guess I just show up? This is probably fairly petty, but any time I get a windshield flyer or something on my door, it seals the deal that I won’t be taking part. It’s obviously an event that God can, and hopefully will use! Whoever the uncontactable entity behind the event is, they’ve obviously invested a decent amount of man hours and budget to advertising the event. Every house in my neighborhood had a flyer on their door. Hopefully it will stir up people who are hesitant to church to grab their curiosity. Hopefully the topic will be handled well and be exegetically and theologically accurate. Whoever is behind the event has a great opportunity to follow up with unchurched attendees, assuming the methods and manpower are in place. There are a few things I would have done differently, and I won’t be at any of the nights (partially due to schedule conflicts). But, it’s an event I’ve put into my iCal. I pray that God uses it to bring people from the community to get a taste of what the church should be like, and hopefully will bring unchurched people in and get them connected with believers. I also pray that the topic is handled scripturally and with wisdom. If you haven’t yet, check out the introduction to Snappers on the first walkthrough post. Here’s the walkthrough for Area 5. Here’s the walkthrough for Area 4. Here’s the walkthrough for Area 3. Here’s the walkthrough for Area 2. If you’re anything like me, you love the iPhone game “Snappers”. If you’re anything like me, you hate the iPhone game “Snappers”. It’s one of the most frustrating things on the planet. The object of the game is to pop these little square punks and let them destroy their friends. If you don’t have it, here’s a link. It’ll frustrate the life out of you. So here’s what I’ve done…I’ve put together an iPhone Snappers Walkthrough. Here’s a key to beating all of the levels. I have scoured Yahoo! Answers, Google, hours of frustrating first-hand experience, and expert guesswork to put it together. I hope it’s helpful. Here’s how the guide works. Each level gives you the combination of clicks you need to do, based off of the grid below. Warning: A hint of crude language. Last night at FSM, we talked about ways that as believers, we can engage culture. We don’t want to have a lifestyle of “Cultural Monasticism,” where we retreat completely from, or completely into culture. Where Does Your Church Fit?